This Instant Pot dish combines all the flavors of tasty Enchilada Verdes into one simple soup! Chicken, beans, rice, and green chilies and more….add this to your meal plan for a homerun dinner! As many of you probably know by now, I am an avid Instant Pot user. I bought one a few months ago and it was love at first sight (or first use). Since then, not a week goes by that I don’t use it at least one time! Anytime we go out to for Mexican food, my hubby always order the enchiladas. It can’t have the red sauce, it must be the green sauce, and that is how he judges the quality of the restaurant. We have one tried and true restaurant up the road from our house that we love and order frequently from. Their Verde sauce is probably the best we have ever had and that is saying a lot since we have tried our fair share of restaurants. 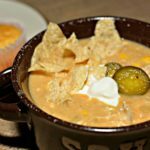 When I came across a version of this soup, I knew I had to try it! I threw the ingredients into the Instant Pot one evening and it was a huge hit, kids included. I made some Green Chile Cornbread Muffins to go with this and we all scraped our bowls clean. It made enough for my family of 5 to have leftovers again the next night! Not only was it incredibly simple to prep, but once cooked, the flavors were great! Shredded chicken, tender beans, corn, rice, Green Chiles, and more! 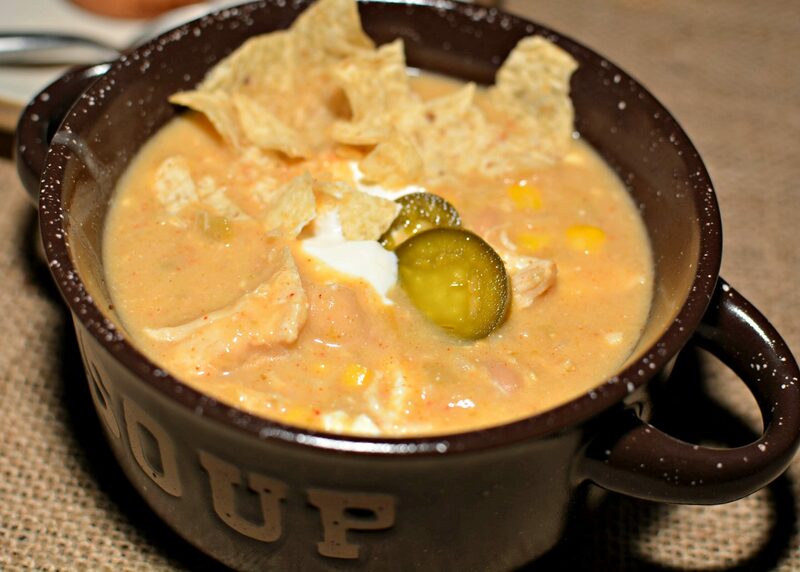 We added a dollop of sour cream, as well as a few jalapenos and thoroughly enjoyed this! Another great addition would be chopped avocado! I didn’t have any on hand otherwise I too would have added some! If you have been considering an Instant Pot, I highly recommend ordering one up and trying this recipe! Once you learn the hang of it, its a simple kitchen appliance, not scary at all, and can replace your slow cooker and rice cooker! Win win, right?! 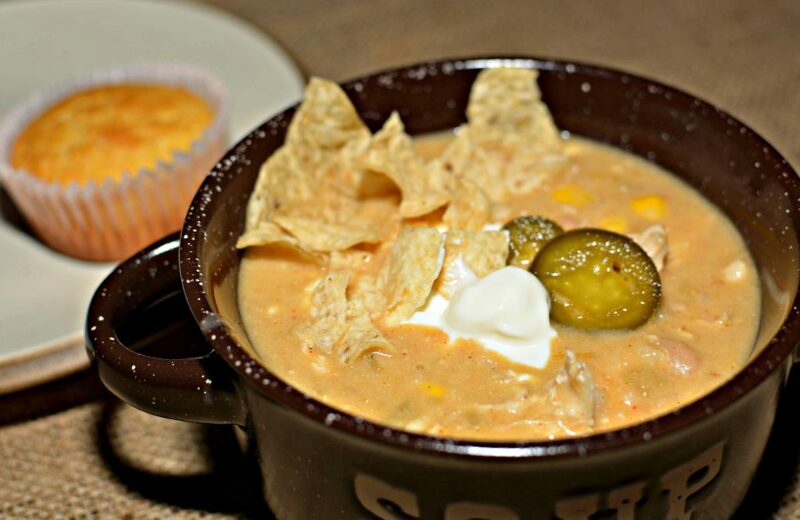 This Instant Pot soup comes together in no time and is packed with shredded chicken, beans, corn, rice, green chiles, and more! Add the chicken, broth, enchilada sauce, chilies, salsa, cumin, chili powder, onion powder, garlic powder, rice, and beans to the Instant Pot and stir. Cover and secure the lid, making sure the top valve is to the "sealing" position. Set the timer to manual, high pressure, for 22 minutes. Once timer is up, allow a natural pressure release for 10 minutes (meaning don't touch it for 10 more minutes). Allow a quick pressure release to remove any remaining pressure. Uncover lid and shred chicken using two forks. Stir in the corn, cream cheese, and lime juice. Once cream cheese has melted into the soup, serve into bowls with sour cream, avocado, and jalapenos on top!